Well Loyal Legionnaires, here are a couple of things I am working on....Prints for the Burroughs Dum-Dum in Chicago this year. As I am sure you know if you tune in often, I will be one of the guests this year. One problem with that is, as most of you know, I did the cover to the Mucker digitally. So hence, no painting to sell to make any money. Not that I am trying to make a killing with my art. It isn't about that as you well know, if you know me. So the object is to produce something that will get some of my art out there in the public a bit more. Which sometimes is the object of this game of art. So I thought I would produce some posters/prints of two of my Burroughs pieces. 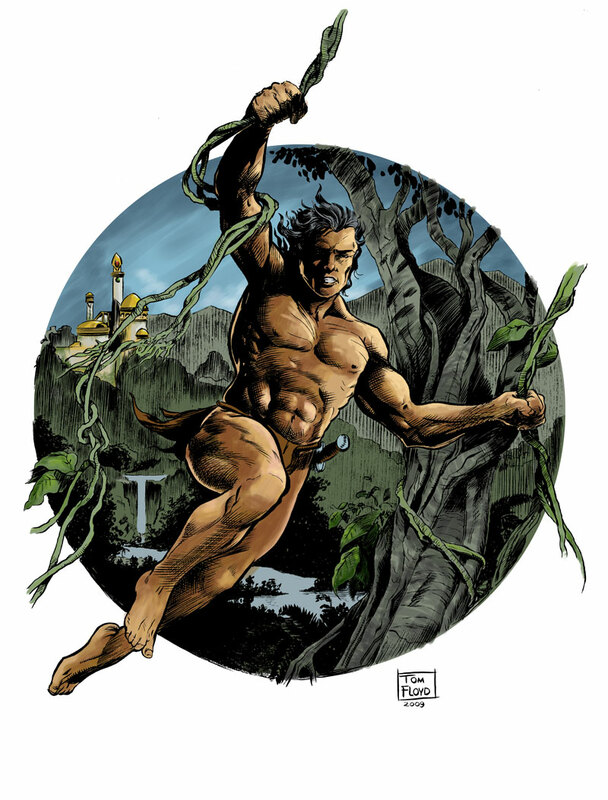 One the Mucker cover I produced for the Dum-Dum (in the tarzan books the council of the apes), and the other a Tarzan piece I produced in black and white, colored for the print. I originally produced the Tarzan piece, thinking it was going into an all Burroughs sketchbook to sell at the con. I may still do that too, but at this point probably all I will have time to get printed is the prints. In July I am going to texas to see my eldest son's family, and attend my 40 th high school reunion. I don't want to think about all those years. ha. So that will take some production time away from me. One thing with the designed white space on these I can do sketches to make them feel special since they are printed. But, Loyal Legionnaires don't despair, I am also currently working on the script to issue on of the pulp action Captain Spectre comic. I also already have an outline for the third issue - the sword and planet story, but believe me when I say that story will be the pinnacle of my storytelling. It is the story I was born to tell. I feel that strongly about it. I just can't wait to get to that third one, so that helps with producing the first two stories. As per the poll from the site here, the first one will be a slam bang action piece, the second a world war 2 story, which is in the works also....and the third one, a sword and planet piece that will establish Captain Spectre as the Phantom Soldier from the Skies!!! I am so proud of it I will sneak the working title to you, my Loyal Legionnaires. It is called "the Men Who Lost Yesterday". So stay tuned Legionnaires, it may be awhile to produce these, but by hook or crook I will do it. I live for this. I am removing this post. It seems out of all the visitors to this site this post was drawing all the views, and it was nothing to do with my art. Therefore it was giving a false read to my stats. If removing the pic of lightning from it doesn't show results, then it must be the title and I will remove it. We shall see. 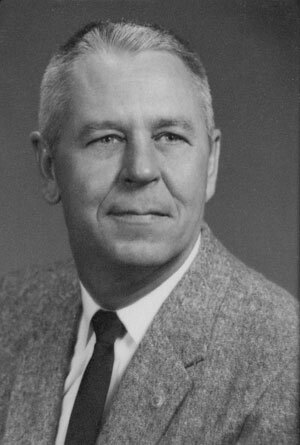 With a small crowd going to show up tomorrow for Father's Day cookout, I was thinking about my dad. He died early in my life and it was a terrific jolt to me. He was really a hell of a guy. A Seabee during World War 2, he served in the Philippines, Leyte Gulf, and around that area. He was a great mechanic, designing tools for the company he worked for. He was a workaholic. I am sure I would have turned out better if he had been around. And for sure I would have turned out different. He was for all his good, totally against art as a career. Which would have probably resulted in one of us leaving, and we all know who that would have been. I am sure we would have butted heads a few times. But I also remember how much he did for me.....from building the world's strongest swing set that still stands today at our old house and I am sure will survive everything short of a 50 kilo-ton nuke! To pulling me around the Nebraska State Fair in a wagon with my broken ankle to see Roy Rogers, to giving me my first dog. Ever since I was a kid, when we returned to our hometown in Nebraska, everyone knew me instantly because I look like him. I can only hope I act a little like him. thanks Pop......I never got to call him that, I would have liked too. Well Loyal Legionnaires, here it is...the long awaited cliffhanger to Chapter 4 - the Day the Sky Screamed! I really have alot of mixed feelings about finishing this chapter up. 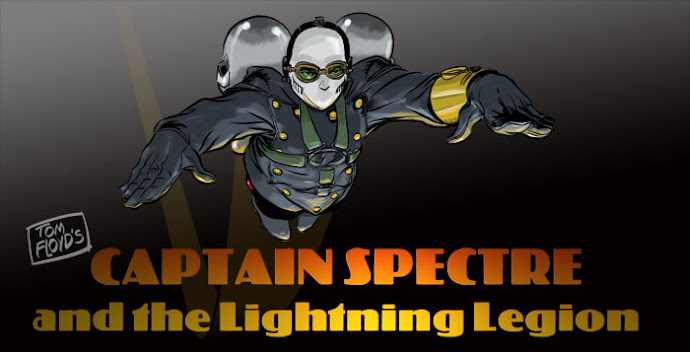 For one I am glad I get to move on to a stand alone issue of Captain Spectre. But sad, to leave the on line strip behind and dormant for a long period of time. 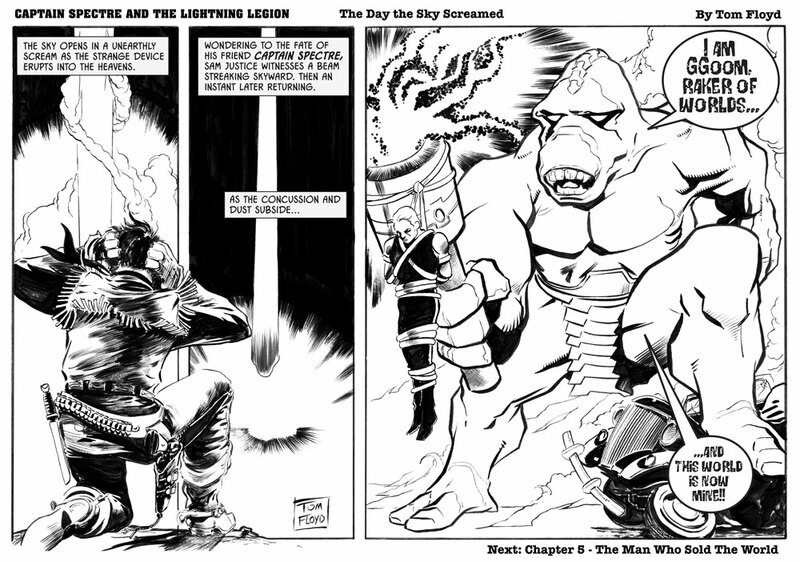 I am sure I will loose all my readers who aren't loyal Legionnaires and check this sketchblog to see what is going on. I know you loyal Legionnaires will check from time to time. I am kind of glad to get to a point where I can work on a few more things. I have a few things to do before the Burroughs convention where I am one of the guests of honor this August. I also have a high school reunion coming up in Texas. It will be the big 40 years and we all agreed to meet at this one. It is also a sad thing as some of my running buddies from that time are dead and gone. But I will also get to see three of my grandchildren. I hate to leave everyone hanging at this point in the story, but I also look forward to the stand alone adventures too. At this point it is a double edged sword. I have to try to do the best with the time and resources I can muster. But you all know that, I have talked about all that many times in the past. There is only so much time in the day, week, and year to get things done. Especially with my day job hanging like an albatross about my neck. So here we leave the good Captain for a bit, hanging from GGooms mace, his rocketpack (turbines) in the hands of the WarMaster, the core members of the Legion not even knowing he is alive yet, Sam Justice seeming out of his league with a monster from the stars. So is that enough of a cliffhanger to get readers back in the future? I sure hope so. I even posted this one a bit bigger so the Jack Kirby-ness of GGoom will come off a bit better. I have always wanted to draw a Jack Kirby kind of fight so I had written this character, but now that I get to show him the strip goes on a bit of a hiatus....oh well, again only so much time in a day. Enjoy Loyal Legionnaires!!!!! Let's hope no kids are watching!!!! In answer to all the comments to the preview post. Here is the sign for the Sturgis motorcycle rally that my son is taking. Previous years I actually tried painting signs like this on banner material, but the paint just doesn't stick to it. So I am having one printed for them to take. Please avert your child's eyes if you click on it. Don't sue me, please I can't afford it. ha. I hear the sign gets results, but I can't afford to go so I have to take their word for it. ha. I think one of the things I thought about as I heard about Al Williamson's death was the fact that the world lost a working man's artist. Bare with me as I try to feebly try to explain my thoughts. 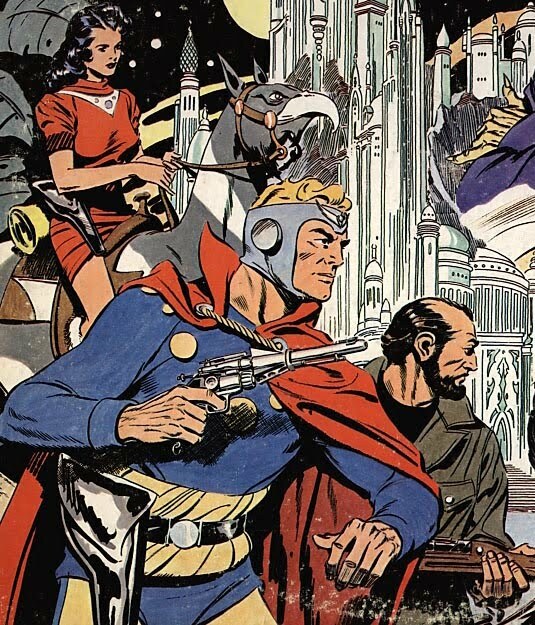 When I discovered Al Williamson's art he was still a current comic artist. Everything I ever read or knew about the man stated he loved comics. 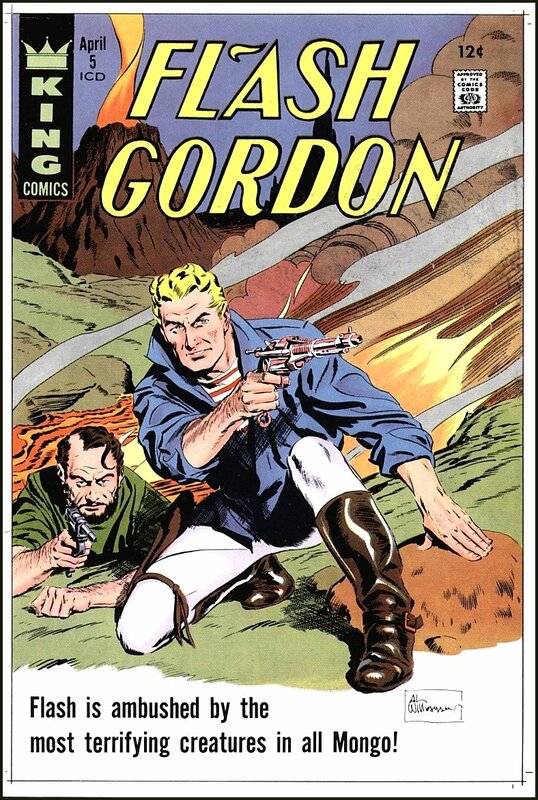 I was lucky enough to buy the king Flash Gordon's he did right off the rack in the little west texas town I grew up in. He graced the pages of Creepy and other mags I bought. He seemed to me like he really loved doing comics. Hence, to me a working man's artist. I talked to him, or rather was a listener at a conversation he was having with some other pros at a comics convention in Dallas one year. And it seemed to me like he did really love comics, his fans, and telling stories. Not only did his linework and graceful artwork fire my imagination, but he worked where ever and when ever he could, it seemed to me. On the other hand someone like Frazetta, who has died recently too and what got me to thinking about this point stuck in my brain, seemed to not really enjoy the work he did. Please understand me, I am not down playing Frazetta's work or anything. Just that all the stories I have read about Frazetta seem really weird to me. Times he would put off a deadline, and dry the paintings in the oven so he could ship them off at the last minute. He always seemed to want to play baseball instead of work. By the time I could read and buy comics Frazetta was done with them. Oh, I saw the odd EC title sometimes in other kids collections and would see his work, which again is great - don't get me wrong I love both artist's work. I guess I am just weird this way....like I heard stories about Warhol or Picasso having others do the work and they signed the art that was kind of mass produced. 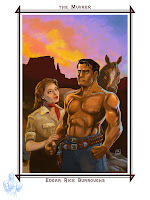 I always kind of felt that if Frazetta could find anyone to do that he might have tried it. Again these are just my feelings welling to the surface over the world losing both of these guys in such a short period. It is kind of the same feeling about two other icons, Bugs Bunny and Mickey Mouse. When I was a kid you rarely ever saw a Disney cartoon. Sometimes before a movie, and sometimes on the Disney show on sunday nights. But it seemed as everywhere I looked there was a Warner Bros. cartoon. Either Daffy or Bugs would be in front of every movie. So of course the point I am trying to make with this is that I ended up liking Warner Bros. cartoons better than Disney ones. Mickey actually never appealed to me, the animation was awesome, just the character didn't do too much for me. Maybe if there were more of the cartoons I might have liked them better. I see some artists at cons with what I like to call the PrimaDonna sickness. I am sure you can tell where this is going. I think of some of these guys in a room in Oz saying 'I am the great and powerful....(insert name here)....bow before me!' I see them barely put up with fans, just so they can get money from them. I am sure you have heard stories or seen artists or celebrities like this. It happens, I understand it. I just don't like it. I know I am rambling about this, but just something I thought about, and something that bothers me. My point being that Al's death hit me pretty hard. I knew he had been sick from talking with Mark Schultz and Tom Yeates and even that made me really sad. But I really admired Al Williamson, he seemed to love comics, come up through the ranks, and worked really hard at his comics. I admire people like that and tend to pass on the people that are just doing comics til something better comes along. I apologize if no one reading this feels that way, and I don't slight any artist work based on that, just the personalities behind the work sometime creeps into my admiration of the work. I tend to admire the working man's artist type, since I have to really work at it just to make each drawing a little bit better than the last one. 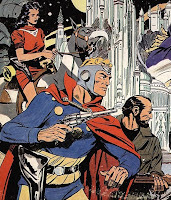 I was just informed of the passing of Al Williamson. And I am at a loss for words. I do think this hits me harder than the news of Frazetta's death. Well, Loyal Legionnaires it was a very busy week and weekend. So sorry no update. I did work on it, along with four other projects. I actually didn't finish any of the four. But at the beginning of the weekend I hadn't even started the four projects. Well five projects if you consider yardwork a project. As I said tho, I did work on the update, the second issue of the Phantom Unmasked, a sign for my youngest son to take to Sturgis this year (a censored preview above), and a KiGor piece. It is now after nine on sunday eve....and I think I still have a bit of energy left, so I am going to work on the update a bit more. Thanks for understanding, it is a busy time for me.....as always. 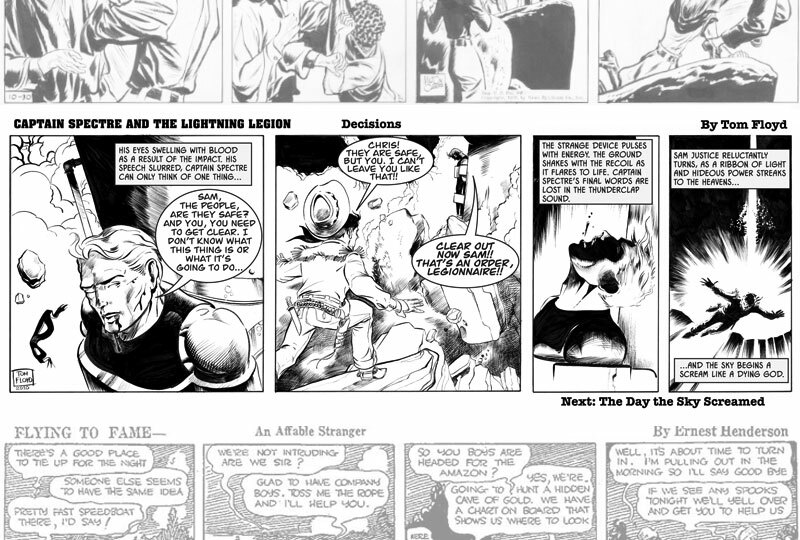 Well Loyal Legionnaires that are tuning into this blog, here is the latest update to the Captain Spectre strip. Chapter 4 is rocketing to a close. Hopefully next week I will have the final installment finished and be able to post it. I have the thumbnails done for it, and although I have tons of other work going on....like Kigor and all, I need to finish this up and get to a stopping point. Well maybe not a stopping point, bad term there for sure, but a cliffhanger point. After all it is all about the cliffhanger, isn't it? And I don't think any of the loyal Legionnaires out there will see what's coming. With a great amount of luck and the creeks don't rise, I will try to have the last part of this chapter posted if not next weekend, then the weekend after for sure. Anyway it will be tough for me to leave the on line strip alone for awhile. I have promised myself to produce a Captain Spectre comic. I need to really do this, and I do hope all of you understand that. I need another form of the strip to reach out to people. You know it is still strange to me that sometimes at a convention I will try to get people to read the strip. I tell them it is an online strip, and free. And it seems even in this day of technology and all, they just get a blank look. Read comics on the web? How weird, right. And it's free? what a concept. Anyway I need more power to reach the people that like comics. My schedule just won't let me do alot of things at one time. So with the commitment of KiGor to Moonstone, my day job, and all....one thing just has to set idle for awhile. I think KiGor will help get my name out there, and also the stand alone Captain Spectre comic. Then I can come back to the strip. It is part of the plan I have to take early retirement, and earn some money from comics to help make the bills as I take that early retirement. That way I can get rid of the biggest headache I have....the dreaded day job!!! I would like to make producing comics my day job. It is part of my plan.